When the National Health Service was first established in 1948, the annual cost of the NHS per head, per lifetime, was approximately £200. Seventy years later, this is now over £2000. In the same period the average life expectancy in the UK has risen by a decade, infant mortality has fallen drastically, and healthcare is more accessible than ever. However, funding the NHS is a complicated task. It is impacted by increasing health costs from an ageing and expanding population and is sensitive to changing government policies. Often, hospital budgets are stretched, and important decisions must be made as to where funding is approved. 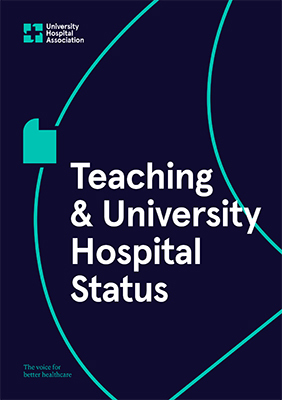 Directors of finance are responsible for setting trust budgets and deciding how funding can be best used, but they must also ensure that it meets the needs of a university hospital by budgeting for research and training costs. The Finance Directors Group is a support network for finance directors to learn from each other and share best practice. It also provides finance directors with a unified voice to influence the finance agenda of the NHS and advocate for policy change. The current chair of the Finance Directors Group is Mike Sexton, Finance Director at University Hospitals Birmingham. This group is supported by Andy Collier, Policy Officer at UHA.